The band is the most renowned and successful rock band in US. Their music is very popular and is played all across the globe. The American rock band from Sayreville, New Jersey was formed in the year 1983. The band came into the limelight with their third album ‘Slippery When Wet’ which was released in 1986. 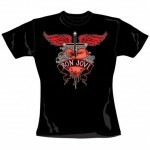 The band has been continuously touring ever since their first album titled ‘Bon Jovi’ was released in 1984. The band returned after a short hiatus in 1992 with their album ‘Keep the Faith’. Their 2000 single ‘It’s My Life’ became an instant hit when released and is still played everywhere. Although the band took various hiatuses for a period of 2-3 years they always reunited to thrill the audience. The band consists of original members lead singer Jon Bon Jovi, lead guitarist and backing vocalist Richie Sambora, drummer/percussionist Tico Torres and keyboardist/backing vocalist David Bryan. The band also had bassist Alec John Such whose departure led the band to hire Hugh McDonald in 1994.